My little Meg (age 3) adores horses - she has quite the collection, including vintage 80's my little ponies! She had a wonderfully pink sparkly unicorn hobby horse that made a neigh and clippity clop sound from a button in it's ear. 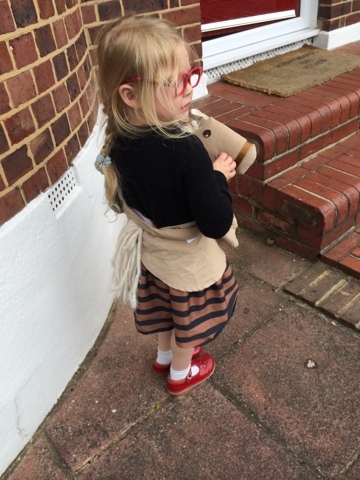 But this unicorn hobby horse did not last long - the fabric covering the stick was so thin a hole wore on the bottom within minutes and in an incident involving Blake (big brother age 5) the stick snapped and the unicorn hobby horse was no more. When I was asked to review My Horse, I knew my little girl would be excited! My Horse takes hobby horses to a new level - they are stick free! Making them more durable (less dangerous) and readily portable - you can pop it in your bag if out and about as they are a wearable hobby horse. 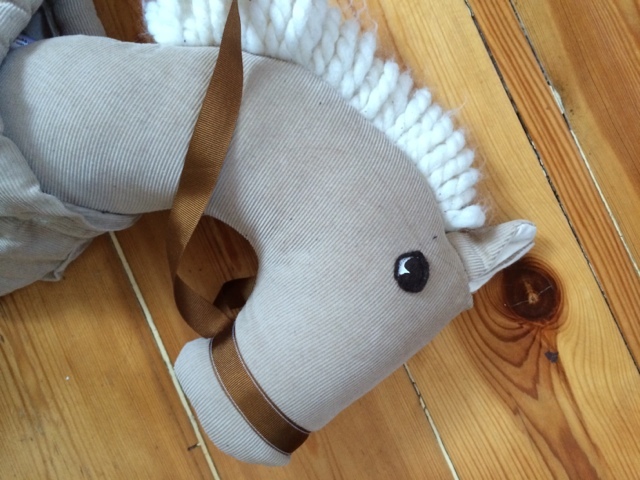 My Horse comes in a range of colours and styles and are of a gender neutral design - available in two sizes, both with velcro fastenings so they are pretty adaptable. 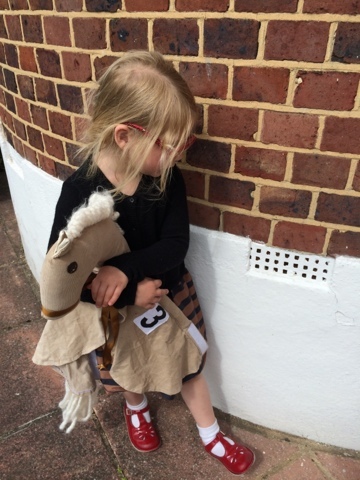 We love that the horse is on an adjustable - Velcro fastening - skirted waistband so your little person wears the horse. 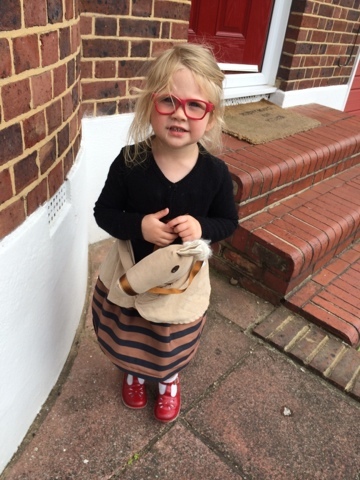 Ours is age 3-6 and fits both my children comfortably. 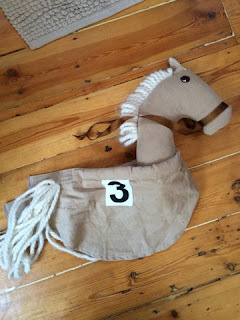 With soft but durable fabric and yarn loop mane and tail our My Horse has already lasted longer than the old hobby horse. My daughter loves the soft yarn and will play with it - often when sleepy. My Horse also has a lovely range of accessories such as small felt jumps to choose from and rosettes - The only problem we had was that the rosette didn't attach to the horse so I added a small stick on velcro dot. At first Meg just wanted to cuddle her My Horse and use her like a soft toy, I have to say as a grown up, it did raise a little giggle when you realise your youngest is snuggling up to a horses head! This was simply because Maegan isn't keen on waistbands! But she loves her My Horse and I prefer her playing with this than a traditional hobby horse because it all just seems a lot safer without the long stick to either trip over or hit your big brother with!!! We've found that it's quite the conversation starter - other mums often come over to ask about our My Horse when we are in the park and it certainly catches the attention of other small people - it seems that most people who see My Horse, want a My Horse - I'm considering asking Ellen, the owner, for a stash of business cards to hand out! The owner of My Horse is a mum herself - you can see how much love she has put into making My Horse. We can't wait to take My Horse on our summer trips to the Lakes and Wales! Please visit http://www.myhorsetm.com to see the current range. Disclaimer - I received a My Horse for the sole purpose of carrying out a review - all thoughts, link choices and photos are my own and I would (and do) recommend this product to others.